It’s been over 20 years since Cornwall hosted OHL hockey on a regular basis. Local hockey fans will have a chance to get reacquainted with the league in September when the Cornwall Civic Complex hosts an OHL preseason game between the Kingston Frontenacs and Ottawa 67s. 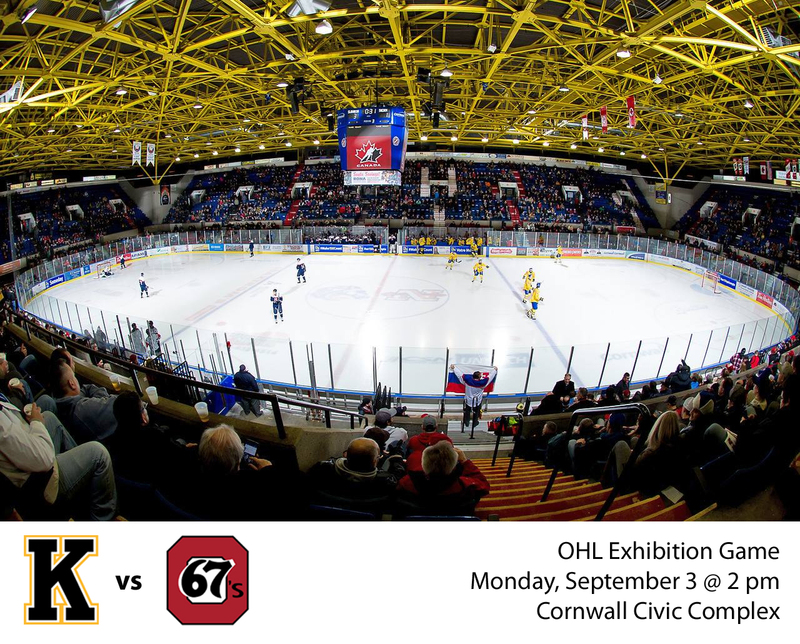 The 67s and Frontenacs will face off in an exhibition match on Labour Day, Monday, September 3rd, at 2 pm. Tickets will be on sale in the near future, with additional details to follow. “The 67s are excited to return to Cornwall to take on the Frontenacs in a first-class venue,” said James Boyd, General Manager of the 67s, who will serve as the home team for the contest. It’s a fitting matchup that will certainly bring back memories for old-time hockey fans in Cornwall. Both the Fronts and 67s were big rivals of the beloved Cornwall Royals, whose three Memorial Cup banners still hang proudly from the rafters of the Civic Complex. “Obviously, having Doug Gilmour as our President of Hockey Operations and his connection to Cornwall makes our exhibition game that much more exciting. We’re looking forward to playing Ottawa in front of a great crowd as we all know how passionate the Cornwall area is about hockey,” said Frontenacs General Manager Darren Keily. The exhibition game is presented in partnership with the Cornwall Colts, who continue the proud tradition of junior hockey in Cornwall. This past season, the Colts held tribute nights for the Royals as well as Royals great Dave Ezard, raising his familiar number 6 up to the rafters. The team also put on a Royals-Colts alumni game during the Rogers Hometown Hockey visit to Cornwall. Kingston and Ottawa are both members of the OHL East Division. Both teams are coming off playoff seasons, with the 67s losing in the first round to Hamilton and the Frontenacs making it to the Eastern Conference Finals.